Very good quality. It comes carefully packaged, however I was missing a couple of pieces. Because I had order more than one, I was able to use the extras to make up for the ones missing. Overall I am very satisfied with this product and will be ordering more in the future. This stunning 3-light Crystal Wall Sconce only uses the best quality material and workmanship ensuring a beautiful heirloom quality piece. Featuring a radiant Chrome finish and finely cut premium grade reflective Golden Teak colored crystals with a lead content of 30-percent, this elegant wall sconce will give any room sparkle and glamour. Shop our entire Lighting Collections. Dimensions 12.0 In. X 10.0 In. X 20.0 In. 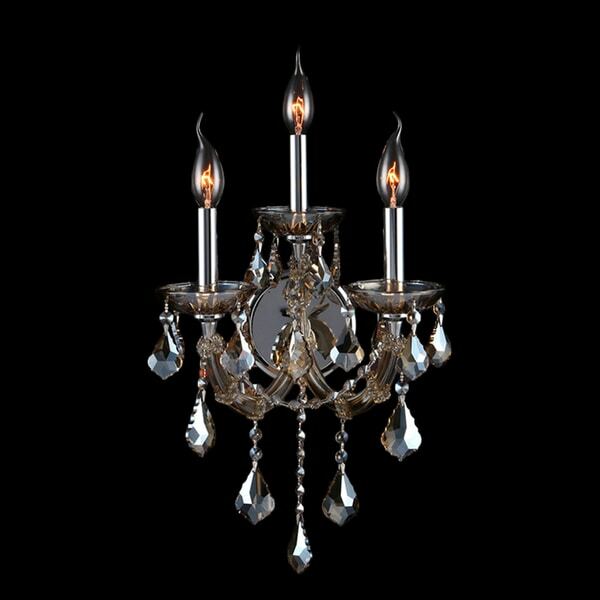 I recently ordered the 8 light chandelier (same collection) and was very pleased with the quality.